When can you work in local live radio, at a private aviation company or in a famous auction house? The answer is, by participating in the school’s annual Work Experience; these are just some of the occupations that current Year 11’s carried out during the Work Experience programme in recent years. There are usually one or two impressive and interesting placements each year; a stud farm for stallions and another position found at West Ham - the student took a chance and wrote to the Foundation only to be accepted - proof that a wild card can work. Our students always rise to the challenge and source interesting and stimulating placements; going out into the work place and experiencing life outside the comfortable environment of school can be both a revealing and rewarding experience. Although students are not necessarily doing a job that might be their chosen career, there are many benefits to be had; from renewing learning and motivation in the classroom, to teaching life skills and attributes that can be adapted and used in any future chosen training or profession. Work Experience is no longer seen as CV fodder; this important curriculum dimension can really help students understand and acclimatise to the world of work not to mention the important social and cultural aspects. 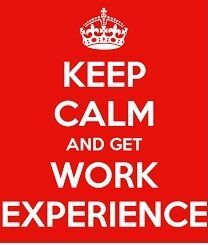 For some students, Work Experience will be the first time they have come into contact with adults other than family members or teachers. It’s not just social skills that are picked up; students are able to apply subject knowledge and expertise, both of which are an excellent way of raising self-esteem, confidence and independence - virtues that can be as important as academic qualifications. They are able to make more informed career choices without long term commitment and after all, it may help decide what not to do as well as enthuse and inspire them in their chosen career area. A successful period of Work Experience and a good reference can be a valuable asset for a student, giving them a competitive edge at either a job or university interview. A stressed job market and high university fees means that a period of informal employment or internship might be crucial if our young people are to succeed and establish themselves. On leaving education, young people face greater competition for work from older workers delaying retirement and graduates taking jobs once the preserve of non-graduates. The proximity of Brexit highlights the importance of home-grown skills - important for the future of the UK economy. It is in everyone’s interests that young people make decisions to go into courses and jobs that make good use of their talents, in which they will be able to succeed and which relate in some way to what the economy needs. The Work Experience programme and its importance should not be under-estimated and for students who embrace the initiative, the rewards are high. It could even lead to some paid part-time work or an apprenticeship; there are several students who over the years, have successfully turned their placement into an apprenticeship. Students who show a mature and forward thinking attitude are noticed – and prospective employers can easily recognise motivation and interest in the youngsters placed with them.